At the 3rd Caribbean Consultation, Rev. Dr. Oral Thomas, Acting President of the United Theological College of the West Indies (UYCWI) issued and invitation to the FB Synod to do an “immersion” journey to Jamaica. Plans immediately began to develop for a group to travel to Jamaica in January 2019, stay at the seminary, and be “immersed” in the culture. Morning lectures and presentations by seminary and neighboring University of the West Indies professors on church history, the history of Jamaica and the culture of resistance, Rastafari, and the impact of Jamaican music and dance helped the group to understand and appreciate how and why the Jamaican people have developed the religions practiced there today. We also heard from Rev. Dr. Eliseo Perez-Alvarez, ELCA missionary to the seminary, about his work; as well as from Rev. Jaime Dubon, ELCA Global Mission Area Program Director for Latin-America and the Caribbean, who shared important information about how the ELCA is active around the world, and especially as it relates to our Companion Synod-church program. We attended worship at Providence Methodist church and afterwards were hosted by church members in their homes for fellowship and sharing stories. Visits to the National Art Gallery of Jamaica, Devon House, Bob Marley museum, Marcus Garvey museum, National Heroes Park, and the University of the West Indies Centre for Reparation Studies museum added to the experience and reinforced new learnings. The trip was capped by an enjoyable day at Dunn’s River Falls Park soaking in the beautiful Caribbean sun and ocean – and getting soaked while we hiked up the falls! Group members committed to forming a new Jamaica sub-committee, part of the Global Mission Committee, to continue learning and deepening our companion relationship with the seminary. Several hope to return again to the seminary in the future as they develop projects and decide how to best utilize resources to further the mission of the seminary. 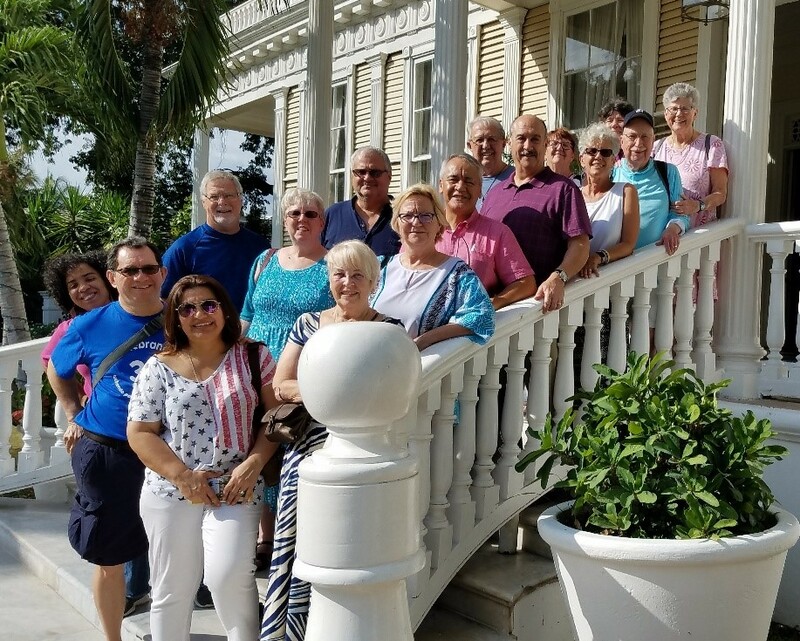 Pictured on the stairs of Devon House from top left and descending – Marcee Wilkes, Barbara Miller, Chris Klafs, Bud Miller, Al Olsen, PJ May, Pr. Dennis Koch, Pr. Jim Neal, Rev. Dr. Eliseo Perez-Alvarez, Pr. Rusty May, Rev. Marjory Neal, Michele Hilton, Rosalena Robinson (UTCWI student), Rev. Jaime Dubon, Marisol Dubon, and Judy Olsen.